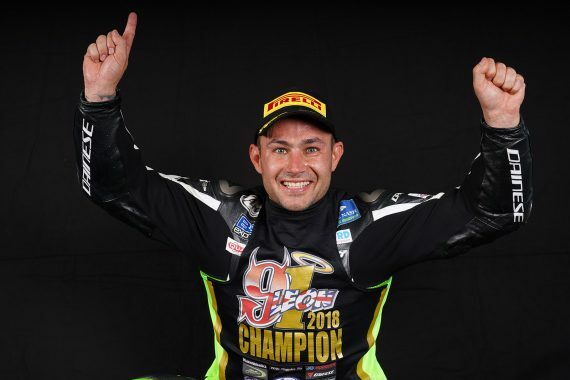 Leon Haslam celebrated his first Bennetts British Superbike Championship title victory at Brands Hatch this afternoon, crossing the line in a safe sixth place to have the edge over Jake Dixon into tomorrow’s two races. It was Glenn Irwin though who was victorious for the first time this season for Be Wiser Ducati, becoming the sixth different race winner of the year, with Dixon and Tarran Mackenzie completing the podium in the opening race to the triple-header weekend. On the fifth lap Richard Cooper and Tommy Bridewell crashed out unhurt at Druids, the pair had been running inside the top eight, with Jason O’Halloran crashing out a lap later at Graham Hill Bend. Meanwhile at the front Andrew Irwin moved into second place on the seventh lap to put both of the Be Wiser Ducatis ahead of the chasing pack. Dixon wasn’t giving up without a fight though an he stalked the younger Irwin brother before making a decisive move with four laps to go. Mackenzie then had Andrew Irwin in his sights too and he went for a dive down the inside at Surtees with two laps remaining to fire the McAMS Yamaha back into podium contention. At the front though Glenn Irwin had the edge to hold off Dixon and Mackenzie to the chequered flag as Andrew Irwin equalled his best finish of the season. Peter Hickman held on to fifth place for Smiths Racing BMW ahead of Haslam who had done enough to become British champion after a season that has seen him score 14 race wins and only failed to finish off the podium four times. Haslam was ahead of 2015 title-winner Josh Brookes and James Ellison with Danny Buchan edging out Michael Laverty to complete the top ten. Speaking after sealing his first BSB crown a delighted Haslam said: “It’s like a big weight’s been lifted off my shoulders. Honestly it was kind-of one of those races I knew I didn’t need to push on, I needed to stay out of trouble. I got really pushed out wide in turn two and then it was Cooper I think crashed out in front of me and I was just like ‘stay out of trouble, stay out of trouble’. “I saw Jake wasn’t leading so I knew top seven was good enough and I was running in sixth with a big gap. I wanted to have a go at Hicky and Tarran to try and get on that podium but I just didn’t want to risk it. This entry was posted	on Saturday, October 13th, 2018 at 9:47 pm	and is filed under Motor Racing. You can follow any responses to this entry through the RSS 2.0 feed. Both comments and pings are currently closed.